Banjo neck blank preparation begins with the choice of suitable wood. Take a good long look at your lumber before you begin. Hold it. Tap it. Think it over a little. Look down the length of the board and try to identify any warps or irregularities. Look across the board to see if it has any “cup”. 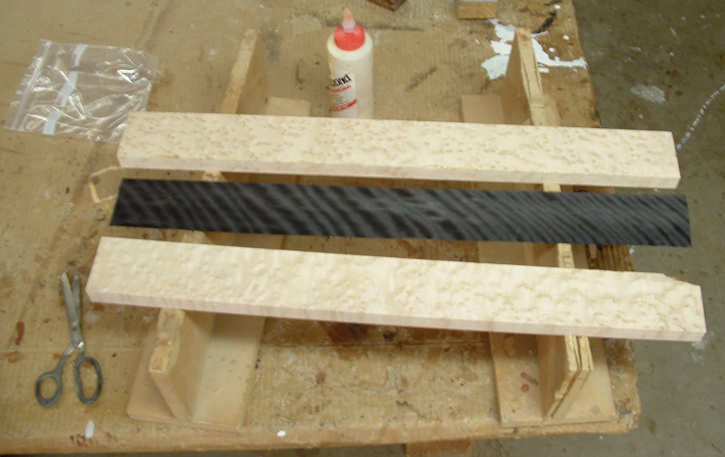 Lay the neck pattern on the lumber and look at it. Are there any warped areas, cracks, or knots that fall into the shape of the neck pattern? Plan to leave out the ugly stuff. Also, consider the rim and whether there is enough lumber to make both a rim and a neck. I sometimes prefer to make the neck and rim from the same wood. Even from the same board if possible. Start with a board that is at least 1.25″ thick and 3.25″ wide in the rough. If it is already surfaced it might be possible to use a board as thin as 1.15″ IF it is VERY straight, but any thinner seems unrealistic for a two piece neck. The thinner the board you start with, the more important it is that it be straight. With a thicker board, a warp may be worked out of it with the jointer. A live demonstration on jointer safety from a wood working professional is highly recommended. In the case of a two piece neck, cut two pieces to 27″ or so long. If you have a great piece of wood that is 26″ go for it. However, it will have to have a small peghead, and it is essential that it have no major cracks or flaws at either end. Before ripping the board check to make sure that your workpiece has a straight edge on it. If it does not, use the jointer to make one edge flat and straight. If need be, rip each piece to 3.25″ wide or a little less with the table saw, the extra .25″ is to allow for more “trueing” with the jointer. If the plan is to make a very deep rim, then cut the pieces wider to allow for it. Look at the lumber again. Are there twists or warps you did not see before? Think on it some more. Lay the pattern on the workpieces again. Test the trueness of your workpieces against the jointer bed or some other surface that is very flat and straight. Look at the trueness of the width as well as the trueness of the thickness. Most all lumber needs to be trued, so do that with the jointer now. Take care to set the jointer cut to be very light at first. True at least three sides, the side that will be the back of the workpiece need not be trued because it will be carved away. Scribbling on the surface to be trued with a pencil is a handy technique that will allow you to see where the jointer is hitting and where it is not. 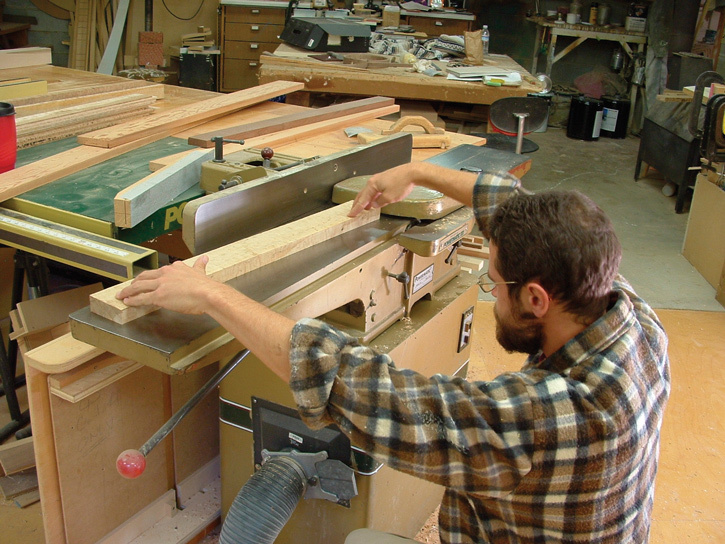 Check your progress between each pass on the jointer. When you are done all the scribble should be gone. Put the two pieces together in the way they will be glued together and have a look, how is it? Do they match up pretty good? Do the gluing faces fit together solidly? This is important to the long-term life of the neck so take your time and look it over really good. Next, look at the surfaces that will become the front profile, the sides intended to be the gluing surface for the fingerboard. The goal here is to create a flat plane from these two pieces. They should be as level with each other as possible, although they will likely have to be trued on the jointer after gluing them together. If you plan to accent the glue joint with a veneer, get it ready. Get the c-clamps ready by opening them up to accommodate the thickness of the workpiece. Plan to stagger the placement of the clamps so that pressure will be applied evenly. 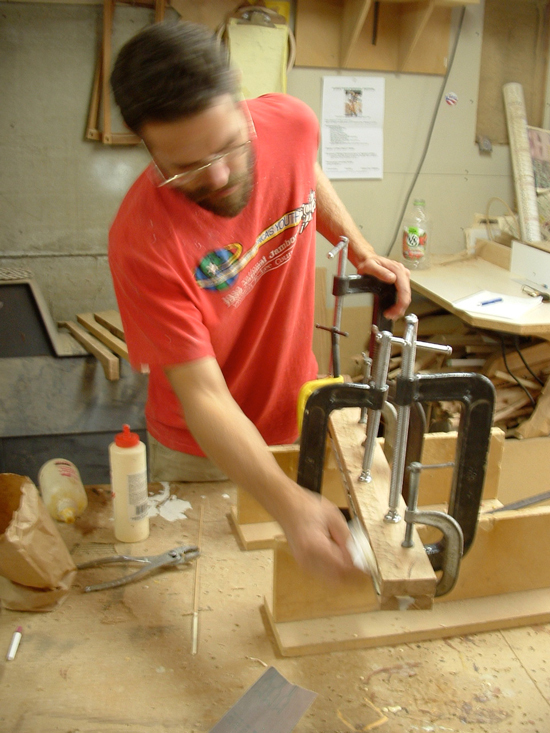 Gluing and clamping a multi-piece banjo neck. Spread the glue onto the mating surface of one of the workpieces. If you choose to accent the glue joint, spread glue on the mating surfaces of both workpieces. This can be a slippery operation so having a friend on hand can be helpful. Put the workpieces together. Get the surfaces of the workpieces that the fingerboard will be glued to as even as possible. Begin by putting a clamp on one end, tightening a little bit, aligning and tightening some more. Work your way down the workpiece adjusting as necessary. Make sure that there is glue squeezing out all around, and that the fingerboard face is as level as possible, check the ends to make sure they are lined up pretty good. Snug up the clamps and let it sit for a while. After the glue has had a chance to set remove the clamps and take a look. Look up and down the length of the workpiece. Do you see any irregularities? Examine the glue joint. If there is a small gap it may be possible to close it with a clamp and some more glue. Take a look down the fingerboard face of the workpiece. Is it fairly even and level? True the fingerboard face on the jointer to be absolutely sure that the fingerboard will have a flat and even gluing surface. True the sides. It is okay for the back side of the neck to be completely uneven for now. If the ends are uneven, trim them with a saw.